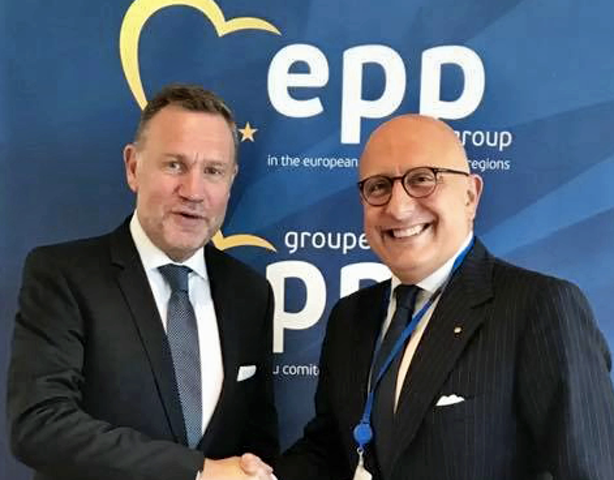 ROME (ITALY), Tuesday, October 9, 2018 (MERCURPRESS.COM) - Gaetano Armao, Vice-President of the Sicilian Region, becomes Vice-President of the EPP Group at the Committee of the Regions of the European Union (CoR). The election by acclamation took place this morning in Brussels at the meeting of the political group in the presence of the EPP Secretary General, Antonio López Istúriz White and the Group leader Michael Schneider. Michael Schneider. Prof. Armao has been a member of the important European institution, representing the Sicilian Region, since last February and has thus become a member by right of the EPP Congress since the one to be held in Helsinki on 6 and 7 November 2018 in preparation for the next European elections. The Vice-President then attended the plenary session of the Committee of the Regions on the "State of the European Union". At the solemn meeting of the Committee of the Regions, the President of the Committee of the Regions, Hon. Karl Heinz Lambertz, and the President of the European Parliament, Hon. Antonio Tajani, addressed the plenary session and congratulated the Vice-President, Armao, at the end of the session. In the photo: Prof Armao with the President of the EPP Group, Mr Schnider.